KUHNER: Will Obama steal the 2012 election? This is a grassroots effort to inform all New Hampshire voters that you have been misinformed, lied to, and betrayed by many in your state government. THERE IS NO SUCH THING AS A FAIR ELECTION IN NEW HAMPSHIRE. Read on as this may be one of the most important and compelling emails you have ever received. If you choose to read every word, review every link and watch every video, it will be more than obvious that we are experiencing the greatest constitutional crisis in our history and New Hampshire is intended to be a part of the upcoming plan to subvert the election process in 2012. The incontrovertible fact is that political elite are trampling the Constitution at every turn and the media is heavily invested in hiding the truth. Did you know that the New Hampshire Ballot Commission failed to vet every presidential candidate on the New Hampshire Primary Ballot for both the 2008 and 2012 elections? What’s more, they lied about their obligation to do so and the facts will show that they are guilty of egregious malfeasance. On November 18, 2011, the New Hampshire Ballot Law Commission heard a challenge on behalf of all American citizens as to whether Barack Obama’s name should remain on the New Hampshire Democratic Party presidential primary ballot. The evidence presented to the Commission was comprehensive, substantive and detailed. It was based upon the presidential eligibility clause of the U.S. Constitution and included Supreme Court decisions and precedent which served to affirm the intent and the legal interpretation of the Founding Father’s use of the term Natural Born Citizen in Article 2, Section 1, Clause 5. Additionally, documents and reports by official agencies of theUnited Statesgovernment such as the Social Security Administration and the Selective Service Board were produced and evidence from former federal government and Scotland Yard investigators, private investigators, computer software experts, scanner experts, typographer experts and forensic document examiners were made available to the Commission. Despite a compelling presentation of evidence, the New Hampshire Ballot Law Commission refused to consider the merits of the complaint. Instead, the Commission claimed that under New Hampshire law their only responsibility was to determine if the prospective candidate had filed a sworn affidavit stating that he or she was legally qualified to run for office and to ensure that the appropriate filing fee of $1000 had been paid! This claim by the New Hampshire Ballot Law Commission that its role is merely clerical flies in the face of common sense, is an abrogation of their sworn duty and the trust placed in them, and clearly contravenes New Hampshire state law. Here is a recap of laws broken related to this sordid affair. Note: These all fall into the category of allegations, since formal charges have not been filed and convictions not obtained. 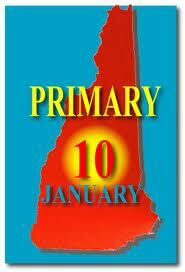 NH RSA 655- 655:17-b Declaration of Intent; Presidential Candidates Who File Nomination Papers. I. Declarations of intent for each candidate for president who seeks nomination by nomination papers shall be in the form provided in paragraph II. Declarations of intent required by this section shall be filed with the secretary of state, signed by the candidate, and notarized by a notary public. II. I, _________, swear under penalties of perjury that I am qualified to be a candidate for president of the United States pursuant to article II, section 1, clause 4 of the United States Constitution, which states, “No person except a natural born citizen, or a citizen of the United States, at the time of the adoption of this Constitution, shall be eligible to the office of President; neither shall any person be eligible to that office who shall not have attained to the age of thirty-five years, and been fourteen years a resident within the United States.” I further declare that I am domiciled in the city (or town or unincorporated place) of _____, county of ____, state of ____, and am a qualified voter therein; that I intend to be a candidate for the office of president to be chosen at the general election to be held on the ____ day of ____; and I intend to file nomination papers by the deadline established under RSA 655:43. I further declare that, if qualified as a candidate for said office, I shall not withdraw; and that, if elected, I shall be qualified for and shall assume the duties of said office. Plaintiffs were told that the Commission doesn’t do things such as THIS (disqualification of Presidential candidates Sal Mohamed and Abdul K. Hassan. In 2006, this same BLC struck the names of eight (8) candidates for state representative from the ballot for ineligibility for that office: Fran Defeo,Robert Ordonez, Maureen Baxley, James W. Danforth, Matthew B. Preston, Greta M. Cocco, Ron Peddle, and Matthew Covey. N.H. Asst. Attorney General Boffetti told the five Ballot Law Commissioners deciding the N.H. State Representatives’ complaint that they could only consider whether Mr. Obama had properly filed his declaration of candidacy form according to N.H. law and paid the $1,000 filing fee. In other words, they were not allowed to rule on Mr. Obama’s purported Constitutional ineligibility for office. The New Hampshire Ballot Law Commission and their consulting attorney claimed that “the law” refers only to the Ballot Law Commission Revised Statutes Title LXIII Chapter 665.47 and 665.48, and that they only have jurisdiction to rule on whether the candidate application is filled out appropriately and the check for filing is valid. This is patently false, belied by the fact that the New Hampshire Ballot Law Commission rejected eight candidates from the ballot in 2006. But in this case, five years later, the BLC denied having jurisdiction. 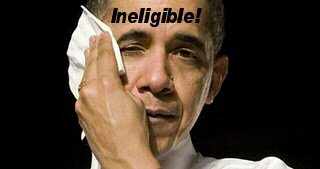 The law is, that to be eligible for the Presidency, you MUST be a natural born citizen and Obama is NOT a natural born citizen. “Obama” is NOT even anAmericacitizen, according to the Constitutional Framers. You will see that all my quoted sources are from the Library of Congress, so to CHANGE the framer’s intent, there would have had to have been amendments to the Constitution, changing the Presidential requirements and that has never happened! The commission says that they do not deal with criminal matters and do not have the authority to remove “Obama” for not being Natural Born, but that is FALSE because in 2008, the commission removed Sal Mohamed, who was removed from the ballot because he was not a Natural Born Citizen, being born inEgypt. SO THEY DO HAVE THE AUTHORITY! Section 665:3 Political Contributions Prohibited. There shall be 5 members present in person at all meetings. In case any member of the commission is absent from any meeting or unable to perform his or her duties or disqualifies himself or herself as commissioner, an alternate member who shall have the same qualifications as those of the commissioner whose place he or she is temporarily filling shall perform the duties of the commissioner. Only a natural born citizen can legally be President of the USA. ”Obama” is not one. If the Commission’s failure to do the right thing is not outrageous enough, there is clear and irrefutable evidence that the New Hampshire Ballot Law Commission was not legally constituted and that members of the Commission were in violation ofNew Hampshirestate law that regulates their lawful conduct in the Commission. We the people believe that the actions of the Commission are in clear violation of state law and an indisputable breach of the public’s trust. The Commission has a duty to the citizens ofNew Hampshireand Americans at large to ensure fair and honest elections and it starts with vetting a candidate’s qualifications under the law. The full legal burden of proof is on the candidate to prove eligibility, not on the public to prove ineligibility. The New Hampshire Ballot Commission has failed to do its job. We the citizens ofNew Hampshireand the citizens of theUnited States of Americaat large believe that the New Hampshire Supreme Court should have held a public hearing forthwith to properly address the issues outlined in this Petition. The New Hampshire Supreme Court has a moral and legal obligation to get this right and ensure that the state’s laws are upheld so that the election process can proceed honestly and fairly. 1. Can the Secretary of State and the Ballot Law Commission render a ruling with total disregard to the pertinent provisions of the U.S. Constitution? 2. Can the Secretary of State and Ballot Law Commission render a ruling in total disregard to the pertinent election law statutes? 3. Can Respondents render a ruling in total disregard of all existing precedents? 4. Is the ruling rendered by Respondents in violation of the constitution, law and precedents, a lawful ruling? 5. Are the rulings by the Ballot law commission lawful, when the commission is not lawfully comprised? 6. Does a conflict of interest invalidate the decision by the commission members? Unfortunately on Wednesday, December 28, 2011, the New Hampshire Supreme Court wiped its hands clean of the controversy. Despite overwhelming evidence of misconduct and misfeasance by the New Hampshire Ballot Commission, the Court declined to review their actions.. In so doing, they abrogated their responsibility to ensure that the laws of New Hampshire were upheld. Instead they chose to deny the voters ofNew Hampshirea clean and fair election pursuant to the United States Constitution, the Supreme Law of the Land. IT’S TIME TO FIGHT BACK AND LET YOUR VOICE BE HEARD! Help spread the word about ongoing election fraud in New Hampshire. We must uphold the Constitution of the United States and protect those principles upon which America was founded. Please do your part, for your children, for your children’s children and for future generations. PLEASE FORWARD THIS EMAIL TO YOUR FAMILY, FRIENDS AND EMAIL CONTACTS LIST. The New Hampshire Ballot Law Commission held a hearing on 18 November, 2011, in response to a complaint by a number of your NH State Representatives that a presidential candidate’s application and declaration of candidacy did not conform with the laws of New Hampshire (BLC 665:7 Filing Disputes). At this hearing, testimony and 85 pages of evidence were presented showing that the declaration on the application submitted by Mr. Barack Hussein Obama II was, in fact, not true, and that his application was in effect a false swearing. (“No Person except a natural born Citizen” – i.e. born of both U.S. Citizen parents – “shall be eligible to the Office of President.”). Mr. Obama, admitted to have been born of a British/Kenyan father, obviously is not eligible, and his candidacy does not conform with the laws of New Hampshire – nor with the requirements of Article II, Section 1 of the Constitution. Although on July 19, 2011, less than 4 months earlier, the NH Assistant Secretary of State, Ms. Karen H. Ladd, signed a denial letter to a Mr. Abdul K. Hassan, Esq. to be on the ballot in NH, stating that ‘this office will not accept a filing from any person who is not a natural born citizen’, she stated under oath that the Secretary of State’s office had no further responsibility to check the veracity of an applicant’s application – unless there was a challenge. However, there is no recorded challenge to the application by Mr. Hassan; and the challenge to Mr. Obama’s application was for the exact same reason – with documented proof of his non-natural born citizen status! Bradford E. Cook ( Manchester ); Jane Clemons ( Nashua ); Martha Van Oot ( Concord ); Jameson S. French (Portsmouth); & Margaret-Ann Moran (Hillsborough). As a result of this blatant election fraud being perpetrated upon the citizens of New Hampshire, there will be a public Press Conference held on the steps of the State House in Concord, NH, on Tuesday, Jan 3, 2012 at 10:00 am – to notify the people of NH of the corruption within their government, and a planned course of action to restore the rights of the citizens to a fair and Constitutional vote. Look out for further details on this rally. Although Obama issued no proclamation for Easter this year,the first family made time to celebrate racially aggrieved deception. Kwanzaa was created —invented —by Ron Everett,who later dubbed himself Maulana Karenga (which means “master-teacher of nationalism”in Swahili). He founded The Organization US (“United Slaves”). His followers murdered two Black Panthers in 1969. Everett was convicted of the May 1970 torture of two women in his home,and served only a portion of his sentence —some claim because he became an informant for the FBI. In essence,Everett admitted his holiday was a racist fraud. No wonder it so enthralls our president. can honestly say I no longer live in the country where I was born. I was born in the United States of America. Today, I live in the United States of America. The street names look the same as they did when I was a child. And so does the mighty river called the Mississippi that chops the eastern third of the nation from rest of America from a rocky creek in Itasca, Minnesota to the Gulf of Mexico like a knife separating the social progressive liberal union States in the East from Middle America where old-fashioned values have not yet been corrupted by Machiavellian, greedy opportunists who sold their souls and sold out their country to those who are determined to destroy the island of liberty to make sure that those trying to escape tyranny had no place to flee. 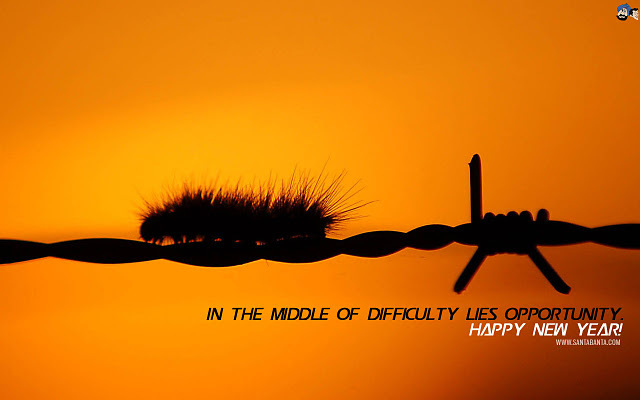 When there is no hope, it is easier to shackle humanity to the yoke of servitude. When there are no inalienable, God-given rights, then all rights are owned by the masters of the universe who will then possess the power to dole them out to the obedient human chattel and deny them to those deemed not loyal to the New World Order. The America I remember as a boy was one in which the Bill of Rights still worked because the New Deal-era social progressives who caused the Stock Market crash of 1929 that triggered a decade-long depression were forced back into their closets at the end of World War II. They stayed off the radar screen until an unknown peanut farmer-slash-governor of Georgia, Jimmy Carter, sold his soul to oil magnate and global financier David Rockefeller for 30 pieces of silver and ran for the job as President of the United States in 1976. 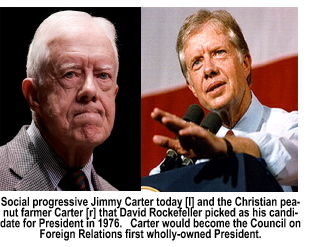 Carter was the perfect Manchurian Candidate. He projected the simulacrum of being an honest, God-fearing Baptist Bible-thumper—which was good for votes in the South. And, it was good for votes in the farm States. Most of all, Carter's appearance as a Christian conservative was good for holding the swing votes that Christian Republican candidates usually pull from left of center Democratic candidates—which Carter was, only he didn't have enough of a track record in Georgia for the nation to see at the time. Evidence exists that Carter was actually the first presidential wanabee who left political footprints to verify that he actually applied for the job of President of the United States—to the world's most powerful political puppeteer. In July, 1972, Rockefeller formed what would become the Trilateral Commission. An exploratory meeting of the Trilateralists was held at Rockefeller's very private Pocantico Hills estate in New York's Hudson Valley. Two hundred-fifty industrialists and bankers, most with interlocking Bilderberger memberships, attended the first meeting. Sometime between July, 1972 and the spring of 1973, Carter, the Governor of Georgia, joined the Trilateral Commission. Just as Bill Clinton's "interview" for the job of President of the United States with Prince Bernhardt of the Netherlands was staged by Washington-insider Vernon Jordan in June, 1991 at the 37th Annual Bilderberger Conference in Baden-Wertenberg, Trilateralist Zbigniew Brzezinski arranged Carter's interview with Rockefeller. Since the money barons have the ability to manipulate the voting process and pull any rabbit they want from the ballot boxes, all Rockefeller had to do was get Carter known well enough to create the illusion that he was popular enough with the common people to win a national election when, in fact, no one actually knew who he was, let alone what he was. The voters thought he was a Christian peanut farmer from Georgia. He was the third Manchurian Candidate to reside in the White House. The fourth one, Barack Husein Obama, not only would not be an Article II natural born citizen, it appears now that, by accident of birth and circumstance, he might not even be a citizen of the United States. My world, as a very young boy, evolved in the aftermath of World War II. For a brief moment in time, between August, 1945 and June, 1950, there was a calming peace in the world as Americans mourned their losses and prayed to Almighty God for a world that learned from the consequences of war. In 1945, America was the savior of the free world. It would not become the villain of World War Ii for another two decades. I remember pulling my brother's Radio-Flyer wagon down the street on August 14, 1945 when the sirens announcing the end of World War II went off. The wagon was my brother's birthday present from our parents. He let me pull his wagon down to the corner and back. World War II had just ended. I didn't even know the world had been at war although I remember older kids talking about some guy name "Tojo" (Hideki Tojo was a general in the Imperial Japanese Army before becoming the 40th Prime Minister of Japan). He authorized the sneak attack on Pearl Harbor. When the war ended, Prime Minister Hideki Tojo attempted to commit suicide, but failed. He recovered from his wound and was tried for war crimes on Nov. 12, 1948. He was executed by hanging on Dec. 23, 1948. About the only thing I remember about Aug. 14 that year was that it was my brother's birthday. I remember wondering if they were going to blow the sirens on my birthday, too. There was still a national innocence in America in 1945 that had not yet been corrupted by crooked, greedy politicians and the even more corrupt and greedy princes of industry and barons of banking and business. The United States, to most of the human chattel in the rest of the world, was a mythical paradise beyond their comprehension or grasp. It was land of plenty where people did not fear their government. In the 48-star America, people still trusted their elected officials. And they trusted the industrialists who provided the blue chip, blue collar jobs. They trusted their neighborhood banker because behemoth, transnational banks were outlawed in the aftermath of the Great Depression and the face of the bankers they knew were neighbors. And, most of all, they trusted their local merchants—even the big, national chains like Sears & Roebuck, J.C. Penney, Montgomery Ward, F.W. Woolworth's and of course, S.S. Kresges in the days before the birth of the discount store which spawned companies like K-Mart, Woolco, Target, T.J. Maxx, Marshalls, Hecks, Family Dollar, Ben Franklin and, of course, the late bloomer from Bentonville, Arkansas, Wal-Mart. Small town America not only shopped there, they worked there. America, in 1945 was still two years away from Everson v Board of Education (330 USC 1, 18) and three years from McCollum v Board of Education (3233 USC 203). In Everson, the Supreme Court, politicized with New Deal socialists, ruled that the Constitution constructed a "wall of separation" between the Church and State. It did. But, the wall the Founding Fathers actually constructed was designed to prevent the government from interfering with the rights of the people to worship their God in whatever manner they chose—without any interference from the State. The verbiage in the First Amendment is not ambiguous. Nor is it complicated enough for even a stupid lawyer to trip over—unless they want to. The First Amendment begins: "Congress shall make no law respecting an establishment of religion, or prohibiting the free exercise thereof..." What ultimately abrogated the most basic right man possesses—his right to pay homage to his God—were the post-WWII, post-United Nations globalists who needed to erase the Bill of Rights in order to equalize the liberty granted to Americans under the Bill of Rights with the conditional rights granted the citizens of all of the other nations under UN Declaration on Human Rights and under the International Covenant on Civil and Political Rights, which has now been artfully woven into the Bill of Rights by social progressive federal judges. Article 18 §3 of the International Covenant on Civil and Political Rights says: "Freedom to manifest one's religion or beliefs may be subject only to such limitations as are prescribed by law and are necessary to protect public safety, order, health, or morals or the fundamental rights and freedoms of others." The problem here is twofold. First, while they are doing so, the Constitution cannot be amended through juryrigging by federal magistrates who do not have the constitutional right to legislate. The job of the federal judge is to be an unbiased third party who's sole responsibility is to make sure the laws "on-the-books" are being enforced precisely how Congress intended them to be enforced when they were enacted—and that the laws do not violate the Bill of Rights. The federal courts do not have the authority to change the meaning of the Bill of Rights to dovetail with social progressive edicts emanating from the Congress—or the liberal penchant of some federal magistrate. Second, the 1st Amendment cannot be amended or repealed since it prohibits any lawmaking body from constructing any law which abridges the right of the People to worship God as they see fit. Thus, no entity within the government hierarchy of the United States has the authority to create a law that infringes on the right of the people to worship God as they see fit—nor do they who disagree with the religious beliefs of those whose rights they wish to abrogate. What it appears to boil down to is this: the social progressives who are attempting to institute, by fiat, a new utopian world order feel it is unfair that the people of one nation—the United States—should enjoy rights the rest of the world does not possess. That point was stressed by George Soros-funded British antigun advocate Rebecca Peters to then National Rifle Association Vice President Wayne LaPierre when she argued that she "...favors global standards" on gun ownership. No one should be allowed to own them. "No one," of course, excluded nations the UN could not bully, like terrorist nations, China, North Korea or the rapidly reemerging Soviet Union. As Peters knocked the right of the American people to own firearms by implying that today, instead of redeeming pop bottles, Americans in need of quick cash between paydays buy guns from legal gun dealers and sell them to street gangs and traffickers in guns to Mexican drug cartels. Peters told LaPierre that her organization, the International Action Network of Small Arms, was working for a total ban on gun ownership worldwide. 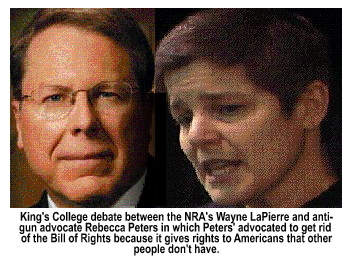 LaPierre said, "If you can't bring yourself to respect the Bill of Rights, at least keep your hands off of it." Why is it so important to the Utopian left to disarms every citizen in the the United States? It's not to protect them. It's to subdue them. The princes of industry and the barons of banking who masterminded the scheme to create a world government controlled by them knew they could not succeed until every citizen in every nation in the world was disarmed. Quoting George Orwell's Animal Farm, Peters replied: "...all animals are created equal, but some animals are more equal than others. 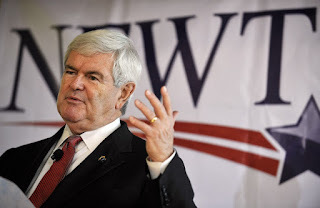 Mr. LaPierre," she noted, "would say that Americans are created even more equal. No. Americans are people just like everyone else on Earth. They should abide by the same rules as everyone else...American citizens should not be exempt from the same rules that apply to the rest of the world," adding that the Bill of Rights should be repealed because, she concluded, "...Americans should have rights not possessed by everyone else in the world." I mention Peters' only remark because it explains the motive for the US federal judiciary climbing into bed with the international judiciary emanating out of the Hague. The globalists behind the New World Order need to "equalize" civil rights around the world—by diluting the rights of the American people whom they feel have more "rights" than society can afford to allocate. The radical changes in the America I knew as a boy came subtlety, one eraser mark at a time over decades as America's Rip Van Winkles slept away their freedom, still trusting the men and women who took bribes from the princes of industry and the barons of banking and business to win election, and repaid their wealthy donors by giving them the keys to Congress. The abrogations of liberty in the United States, which occurred over decades a microscopic inch-at-a-time, were suddenly noticed when inherent rights suddenly became conditional rights, and the Bill of Rights evolved into the UN's International Covenant on Civil and Political Rights. As a boy in a public school classroom in Sault Ste. Marie, Michigan, I recited the Pledge of Allegiance every morning. With hand-over-heart, I said, "I pledge allegiance to the flag of the United States of America and to the Republic for which it stands: one nation under God, indivisible, with liberty and justice for all." My country. My flag. My God. Every morning, when every public school student in the nation recited those words, they were pledging allegiance to their country. And the pledge breathed patriotism into the hearts of yesterday's school children. Today, our school systems are filled to overflowing with illegal aliens. The pledge of allegiance, recited like a prayer to the nation, is no longer a daily ritual in America's school systems. Patriotism is now construed by the taskmasters of Utopia as a form of radicalism in a nation that is rapidly erasing its national borders by forcing the people of various nations—who do not want any part of Utopia—to partake in the metamorphosis of globalism. When I was a boy living on the US-Canadian border, residents of Sault Ste. Marie, Michigan and Sault Ste. Marie, Ontario traveled back and forth between the Twin Cities—in different countries, effortlessly. While there were different exchange rates, Canadians spent their dollars in the United States and Americans spent US dollars in Canada. But, for all the transnational camaraderie, the Canadians remained distinctly Canadian and US citizens remained distinctly American. To the peoples of both nations, the dividing line—the national border that separated them served not to keep the citizens of either nation from entering the other. The US-Canadian border works pretty much the way the borders between the parliamentarian nations of western Europe work—to check who is entering and leaving, and why they are doing so—and to make sure they are not carrying "tariff goods" from one country to the other with paying the required fees. The border between the United States and Mexico is not quite that cordial. The reason it is not is because the nation below us is not that cordial. 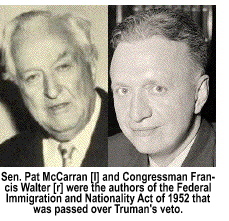 In 1952, the Democratically-controlled 82nd Congress, concerned about an extreme influx of illegal aliens crossing America's Southern border and infiltrating US communities in the Southwest, enacted the Federal Immigration & Nationality Act (also known as the McCarran-Walter Act). Public Law 82-414 restricted immigration into the United States while it ultimately provided natural born citizenship rights to those born on American Samoa, Guam, Swains Island after Dec. 24, 1952. To get the bill enacted over a Presidential veto, the Democratic sponsors had to add provisions that would gain the support they needed to enact it. The Democrats got a caveat—new Democrat voters in those WWII US possessions. So did Republicans. They got language added to the bill that barred several well-known communists (such as authors Graham Greene, Dennis Brutus, Farley Mowat, and Kobe Abe; Nobel laureates Pablo Neruda, Carlos Fuentes and Pierre Trudeau (who would become the Prime Minister of Canada) from entering the United States. In addition to making caretakers of illegal aliens financially liable for any crimes committed by illegals they shelter, Public law 82-414 allowed the US government to deport naturalized citizens or immigrant residents who were engaged in subversive activities (which, today, would include every member of the Congressional Black Caucus, most of whom are "fellow travelers" in the global communist movement that is, once again, gaining political momentum in the United States through billionaire George Soros). Under the Federal Immigration & Nationality Act of 1952 (Section 8 USC 1324[a](1)(A)[iv][b](iii)) persons, groups of persons, businesses, corporations, advocacy groups, or any social engineer that helps an illegal alien has committed a Section 274 federal felony any time they assist an illegal alien. (Just between you and me, let's drop the phony politically-correct rhetoric that refers to illegals as "undocumented immigrants." Granted, they are undocumented. But, they are not immigrants. They are invaders who do not belong here. They are criminals who violated US immigration law. And, they are thieves attempting to steal what does not belong to them—defacto citizenship.) Anyone who assists an illegal alien by employing them, providing them with shelter, transporting them from one place to another, or even assisting them in gaining employment, or even by encouraging an illegal to remain in this country, is guilty of a crime. This crime is punishable by a fine of $10 thousand per infraction, or imprisonment in a federal penitentiary for not more than five (5) years—or both. In the case of politicians, the Constitution requires, first, that they be impeached and removed from office, then charged with the crime they committed. Back in 1952, when I was just a runt kid who had just discovered girls, politics was the last thing in my mind. But I sense that, back then, politicians were not immune from the laws they wrote. Today they are. Under the Federal Immigration & Nationality Act of 1952 persons caught assisting illegals in their quest to remain in the United States, would also forfeit any assets owned by them to assist those here illegally, such as having the automobile they used to transport the illegal seized, losing their home if it was used as a sanctuary for one or more illegals. If the sheltered illegal commits a crime, those sheltering him or her can be held liable for the financial losses suffered during those crimes by those sheltered illegals. The Federal Immigration & Nationality Act of 1952 provides for treble damages to victims of those types of crimes—from the individuals, groups of individuals, advocacy groups, business owners, corporations or, sanctuary cities themselves if they open the door of hospitality to illegals aliens for whatever reason. The biggest problem with the Federal Immigration & Nationality Act of 1952 was that it properly identified the nature of the problem—why illegals were flocking across the border in the middle of the night—and addressed the problem by correctly punishing those who profit from the illegals at the expense of everyone else. The bill was never enforced because the princes of industry and the barons of banking and business who need the cheap labor without the expensive fringe benefits that US employers have provided to their employees since the New Deal Era—to keep the government from mandating them—no longer wish to provide generational benefits to either new hires or to the career employees who built their employer's family-owned corporations into behemoth transnational entities that no longer feel an obligation to recognize the contributions of the baby boomers who now survive on pensions the princes of industry no longer wish to provide. The world you and I grew up in has changed—radically. And, as we sleep away our freedom, it continues to change—always for the worst—with each passing year. It is changing because we—the People—have become fat, apathetic and downright lazy. The merchant princes are providing us with all of the distractions they need to steal our liberty by erasing the Bill of Rights as we watch the Super Bowl, the World Series or the NBA playoffs. We have one honest TV News channel and over 2,000 sports channels. What's wrong with that picture? We elect to public office men and woman who are easily corrupted, and who should be in our jails, not our legislative bodies. We let those "legislators" enact laws which allow them to accept bribes and call them campaign contributions. Then we leave it up to them not to repay the "bribes" with legislative quid pro quos (i.e., earmarks) that cost the taxpayers billions of dollars which their children, grandchildren and great, great grandchildren will be forced to repay as Congressmen and Senators become millionaires providing the princes of industry and the barons of banking and business with the quid pro quos they have demanded to create their utopian, seamless society—a global nation without borders. Today, as we awaken prematurely from our "long winter's nap," we are discovering that while we slept, Barack Hussein Obama gave us the Christmas present that no American wanted— the not quite so subtle erasing of our borders with both Mexico and Canada under a Hillary Clinton instigated State Department protocol entitled "United States-Mexico Partnership: A New Border Vision," that will challenge the traditional views held by most Americans of static national borders. With eyes wide open, we are now about to see the naked reality spawned by Bill Clinton's North American Free Trade Agreement which contained the framework of what is now identified as the Bush-43 Administration's Security and Prosperity Partnership of North America. It was this agreement that has forced open the borders between Mexico and the United States. This broad grant of access applies not only to transcontinental truckers traveling up and down Interstate 35, the NAFTA superhighway (more commonly known as the Texas Transcorridor that parallels I-35 from the Mexican border below Larado, Texas on US 59 to the Oklahoma border via I-35), but also for illegal aliens entering the country in their quest for jobs—your jobs and mine. About the same time the media in the United States reported on Obama's new "border vision" with Mexico and Canada, which is unencumbered by such things as physical borders, the Canadian CTV News said they had obtained a draft copy of another protocol between the United States and Canada. The document was entitled "Beyond the Border: A Shared Vision for Perimeter Security and Competitiveness" authored by a newly created joint US-Canadian advocacy group called "Beyond the Border Working Group." BBWG is just one of about 30 working groups that tumbled from the pages of the Council on Foreign Relation's 2005 Report, "Building A North American Community," which was the blueprint for the gradual erasing of the borders between the United States, Mexico and Canada, and the creation of a North American Commission whose job it will be to structure the new North American Union, create a North American Parliament and, of course, a North American Court on Trade and Investment which will litigate all economic issues in the Americas and erase all trade barriers between the Americas which actually was created under NAFTA on Jan. 1, 1994. This is no longer my America. It is an illusionary fabrication created by the princes of industry, and the barons of banking and business who needed to recast America to protect their ability to profit from the human capital which has, once again, become the chattel of the rich. This is not the America I remember as a boy. 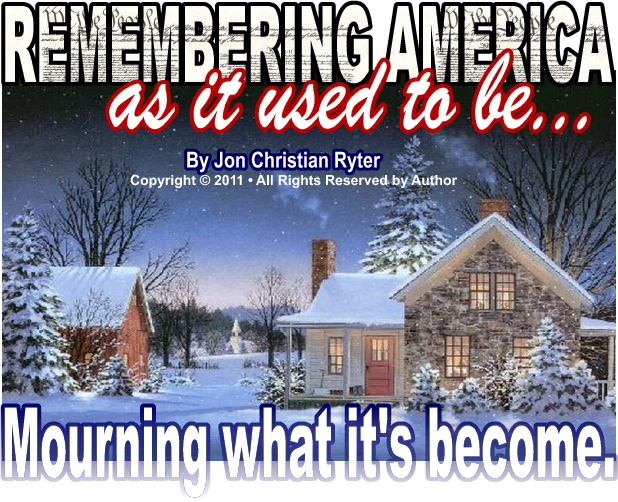 And, it is not the America I want my children to inherit, nor to be forced to have to rationalize to their children how Mom and Dad's generation lost the greatest nation on Earth. We lost it because we were too busy enjoying the good life to pay attention to what the prostitutes of Pennsylvania Avenue were doing. Doing to the Constitution of the United States. Doing to the Bill of Rights. Doing to our money—and doing with our money. Doing to the shattered remnant of the Republic. Ask any American male who won Super Bowl XLIV, and nine out of ten of them will correctly say the New Orleans Saints. And, half of them can probably still tell you their favorite Super Bowl XLIV commercial. But, I'd guess that less than 25% of them can tell you the name of the mayor of their home town, and even less who can name their US Congressman, both US Senators and/or the names of their Assemblymen or Delegates to their State legislature. Today we are living in the social progressive's politically-correct version of America. This is no longer Norman Rockwell's America. If you are looking for that, try your local flea market. Search for old copies of the Saturday Evening Post. Or, better yet, look for old, pre-1950 history books or encyclopedias. When you find them, grab them quickly. 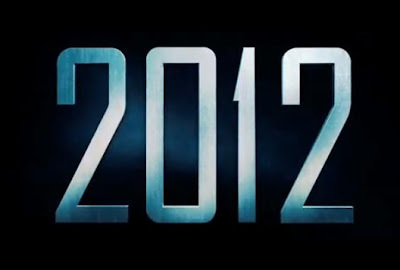 You are about to experience an eye opener because in this instance, old is better than new. The flea market books which have been relegated to the dustbin of history actually contain a more accurate accounting of "history" than the history books and encyclopedias used by our children in America's classrooms today. The pre-revisionist textbooks and encyclopedias depict a more accurate view of America and the principles which made the United States the greatest nation on Earth. Today, the socialist academicians who write the textbooks and edit the encyclopedias have made the United States the world's villain. Think about that today when, with eyes wide open, you look at what's wrong with America. The Republican and media Establishments have joined hands in an attempt to lead America buoyantly, triumphantly off the cliff into the bottomless pit of civilizational dissolution. They have fought their version of the good fight, prematurely creating the optics, and, if all goes well, the dynamics, of a two-man race, where in fact there are six men and a woman. Dr. Ileana Johnson Paugh Full Story This year was not a good year for America, for freedom, for democracy, for law and order. We watched the accelerated disintegration and reshaping of every local, state, and federal institution to the detriment of the American people. Bradford E. Cook (Manchester); Jane Clemons (Nashua); Martha Van Oot (Concord); Jameson S. French (Portsmouth); & Margaret-Ann Moran (Hillsborough). "The ballot law commission shall hear and determine disputes arising over whether nomination papers or declarations of candidacy filed with the secretary of state conform with the law." Obama is NOT even an America citizen, according to the Constitutional Framers. You will see that all my quoted sources are from the Library of Congress, so to CHANGE the framer's intent, there would have had to of been amendments to the Constitution, changing the Presidential requirements and that has never happened! The commission says that they do not deal with criminal and do not have the authority to remove obama for not being Natural Born, but that is FALSE because in 2008, the commission removed Sal Mohamed was removed from the ballot because he was not a Natural Born Citizen, being born in Egypt. "No ballot law commission member shall make a contribution, as defined in RSA 664:2, to any candidate for office or political committee." "No person shall be appointed to the commission who holds an elected office or who is an election official." SOMETHING IS NOT RIGHT WITH CAREER POLITICIAN NH SECRETARY OF STATE, BILL GARDNER...SEE FOR YOURSELF. 35 YEARS AS THE SOS. HMMMMM...TIME TO GO BILL! William M. (Bill) Gardner (born October 26, 1948) is the current Secretary of State of New Hampshire. He is in charge of the department that oversees all general elections, primary elections, voter registration and recounts within the state, including the New Hampshire primary. He currently serves as the Vice-Chair of the Public Advisory Board at the New Hampshire Institute of Politics at Saint Anselm College. He began his career in New Hampshire politics as a state representative and was elected Secretary of State in 1976 by the state legislature. He has been kept in office by both Democratic and Republican legislatures since then. Gardner has taken the lead in New Hampshire's policy towards "100% Paper Ballot" elections, in contrast to some states that use computerized voting systems without paper records of each vote. A strong supporter of New Hampshire's standing as the 'first in the nation' primary state, Gardner wrote Why New Hampshire with the late former Governor Hugh Gregg in October 2003, detailing the history and significance of the New Hampshire Primary. He also appears in Winning New Hampshire, released in 2004. The Plaintiff, David Welden, respectfully submits this opposition to Defendant’s motion to dismiss. For the reasons set forth below, none of the facts asserted by the Defendant are relevant. The only fact relevant to this case is the fact that the Defendant’s father was not a U.S. citizen. This fact has been repeatedly documented and stated by the party opponent, Defendant Obama. This fact is also evidenced by Plaintiff’s exhibit 6, previously submitted with Plaintiff’s pre-trial order and apparently authenticated by Defendant’s citation to this exhibit in Defendant’s “Statement of Material Facts Not in Dispute,” number 7. The Democratic Party of Georgia’s Constitutional right to determine its membership coexists with Georgia’s right to govern Georgia. Georgia code does not interfere with the autonomy of the political party’s internal decision making because it does nothing to prohibit the parties from submitting any name to the Secretary of State for inclusion in the Presidential primary. The Party is free to submit Saddam Hussein or Mickey Mouse as their next Presidential candidate. However, Georgia is not required to accept such submissions and waste taxpayer money on ballots for such candidates. Georgia code does not prevent the political parties from submitting any name. Instead the code simply determines what the State does with the Party’s list of candidates after the Party has forwarded its list to the State. See O.C.G.A. §21-2 et seq. This code does nothing to prevent any political party from excluding, or including, any person they choose to exclude or include. Nor does it prevent the Party from choosing candidates to submit, in its “sole discretion.” Georgia’s code simply exercises the State’s right to administer elections in a manner that best serves the citizens of the State. The Defendant’s argument would logically require a conclusion that no state can preclude any candidate from any primary ballot for any reason without violating a political party’s right to freely associate. Since many candidates have been disqualified from primary ballots for lack of qualification to hold the office sought, we can safely conclude that the Defendant’s argument fails. If his argument succeeds, many election codes across the country will need to be re-drafted. The Defendant states that the issue raised by the Plaintiff was “soundly rejected by 69,456,897 Americans in the 2008 elections.” See Def.’s Mtn. at 5. This statement reflects a complete lack of understanding regarding Constitutional protections. Contrary to the Defendant’s assertion, voters are not the final arbiters of whether an individual is qualified to hold office. America is a Constitutional Republic, not a democracy without a constitution. In a Constitutional Republic the power of the majority is limited and cannot infringe upon protected rights of a minority. The Constitution is an anti-majoritarian document; meaning that it protects individuals from invasions and usurpations by the majority. Constitutionally protected rights are held inviolate regardless of the majority’s desire to violate them. Without such protections any law enacted by Congress would be valid, even if it denied an individual their right to life, liberty, or property. Without the anti-majoritarian protection of the Constitution, Congress could legalize the killing of all Jews, for example, as was done in World War II Germany. Constitutional requirements are absolute, and must be followed regardless of how popular or unpopular such requirements may be, because they are in place to protect the minority. The Defendant’s presumption that popular vote overrides the Constitution demonstrates his lack of understanding of the Constitution and emphasizes the critical role played by this Court in protecting Americans from a tyrannical majority. Contrary to the Defendant’s statement, a minority of Americans have an absolute right to be protected from a non-natural-born-citizen being elected President. The Defendant asserts that the issue raised by the Plaintiff has been defeated by “every judicial body ever to have considered it,” citing dozens of cases. See Def.’s Mtn. at 5-6. However, unlike the instant case, every one of the cases cited was based upon an assertion that the Defendant was not born in the United States, or is not a citizen for some other reason. The matter before this Court has nothing to do with the birth place of the Defendant, nor does it assert that he is not a citizen of the United States. In fact, limited to this challenged primary election, the Plaintiff will stipulate that the Defendant was born in Hawaii, that the Defendant is a U.S. Citizen, and that the Defendant was Constitutionally-qualified to serve as a U.S. Senator. The Plaintiff makes no assertion regarding the Defendant’s passports, or social security number, or any other fact related to the Defendant, other than the one fact asserted at the beginning of this opposition: that the Defendant’s father was not a U.S. citizen. Contrary to the Defendant’s assertions, the issue presented by the Plaintiff is grounded on one uncontestable fact, and one clear definition from the U.S. Supreme Court. See Minor v. Happersett, 88 U.S. 162, 167 (1875). The U.S. Supreme Court has defined “natural-born citizens” as “all children born in a country of parents who were its citizens.” See Minor v. Happersett, 88 U.S. 162, 167 (1875). The Court in Happersett did go on to state that other sub-categories of people may or may not be within the broader term “citizen.” However, it did so only after specifically identifying the narrower category “natural-born citizens.” Id. The Happersett Court clearly understood and established that “citizen” is a much broader term than “natural-born citizens.” Its discussion of “citizen” does not negate or alter its earlier definition of the term “natural-born citizens.” See Id. at 167-168. This precedent has never been questioned by any subsequent Supreme Court. This precedent is binding. Because it is undisputed that Mr. Obama’s father was not a U.S. citizen, the Defendant can never be a natural-born citizen, as that term was defined by the U.S. Supreme Court. Therefore, the Defendant cannot meet the Constitutional requirements to hold the office of President. See U.S. Const. Art. II Section 1.5 Georgia election code requires such a candidate to be stricken from any Georgia ballot. §21-2-5. For the reasons set forth herein, the Plaintiff respectfully requests that this Court deny the Defendant’s motion to dismiss. Complete Opposition to Defendant's Motion to Dismiss below and here. Prior reports on the Georgia ballot challenges here.